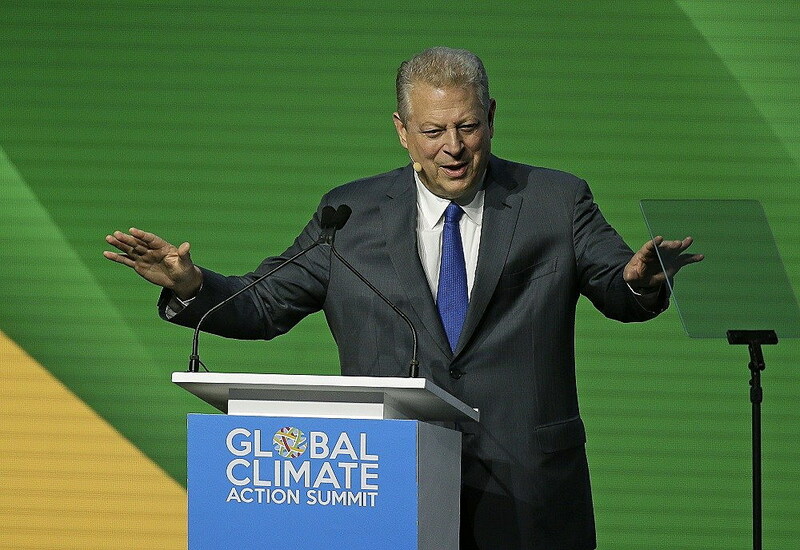 SAN FRANCISCO (Courthouse News) – Former Vice President Al Gore, who jumpstarted global awareness of climate change as documented in the 2006 film “An Inconvenient Truth,” pumped up attendees of the final day of an international summit in San Francisco with a rousing call to action. “We are putting so much heat into the oceans. We’re using the sky as an open sewer. This is literally insane,” said Gore, who remade himself as an environmental activist after losing the 2000 presidential election to George W. Bush. “We put 110 million tons of manmade heat-trapping pollutions up there every day; the cumulative amount now traps as much extra heat energy as would be released by 400,000 Hiroshima atomic bombs going off every single day. It’s a big planet but that’s a lot of energy. And that’s why the temperatures are going up every year,” Gore said. “Every night on the television news is like a nature hike through the book of Revelation. We’ve got to connect the dots between the cause and the effect,” he said, rattling off to raucous applause a host of recent floods, mudslides, droughts and wildfires with the dramatic gesticulations and cadence of a television preacher. The means to combat the devastation of climate change, Gore said, are right in front of us. He also said it’s not too late for the United States to rejoin the Paris Climate Agreement, which President Donald Trump pulled out of shortly after taking office in 2017. “The Paris Agreement has pointed the way to a world that is united in taking action. All 195 nations of the world are committed. And yes, I know that Donald Trump made a speech. But most of you know that under the law – and yes, we are still in the U.S. a nation under law – the first day the U.S. could legally withdraw is the first day after the next presidential election,” Gore said. The former secretary of state, who repeatedly vowed not to get too political with his speech, blasted Trump for mischaracterizing the 195-nation pledge to reduce carbon emissions as a raw deal for the United States. Kerry said he worries the world may already be too far behind its goal of keeping global temperatures within 1.5 degrees Celsius above pre-industrial levels. He called out China, India and Russia as well the U.S. as major contributors to fossil-fuel driven pollution. Kerry’s remarks came as part of a discussion about the ocean as both a victim of climate change and a tool to fight it. “The oceans are critical to the movement of climate,” he said, noting the intense storms pummeling the U.S. in recent years are directly related to warming oceans. Friday marked the last official day of the Global Climate Action Summit hosted by California Governor Jerry Brown, a gathering of climate activists, scientists and world leaders meant to show the international community that the United States will live up to its end of the Paris deal. Closing the summit Friday, Brown revealed the Golden State will develop its own pollution-spotting satellite program. “The climate threat still keeps growing, so we want to know what the hell is going on all over the world, all the time, so we’re going to launch our own damn satellite to figure out where the pollution is and how we’re going to end it with great precision,” Brown said, noting the satellite will pinpoint the source of methane gas and other pollutants. A statement from Brown’s office indicated the system will be developed by the California Air Resources Board, using technology from the San Francisco-based Earth imaging company Planet Labs. Initial funding will come from climate change philanthropic organizations The Overlook International Foundation and the Grantham Foundation. Brown’s plan doesn’t come out of nowhere: two years ago, he promised thousands of scientists at the American Geophysical Union’s fall meeting in San Francisco that “California will launch its own damn satellite” in the face of possible cuts to federal climate change monitoring programs. The goal is to have the satellite launched by 2021 and collecting data by 2022.